Without protection from dust, oil and other contaminants, even the best-applied paint can end up looking terrible. Paint contaminants can take many forms, and knowing where they come from can help you identify paint contamination, whether it’s from botched collision repair or from day-to-day exposure. No, it’s not the type left by nuclear explosions. In this case, fallout is the metal particles and other pollutants that embed themselves into the paint. Where does the metal come from? Trains use friction brakes that flake off metal from the wheels. This can lead to heavy contamination when the car is transported across the country to a dealership. Then, once the car is on the road, more metal flakes off of the brake rotors, landing on the doors and fenders. What else can cause fallout? Pollutants from factories, tree sap, and anything sprayed near your car like pesticides and concrete sealers. From sitting at a dock while waiting to go to the dealer to sitting outside in front of your house, there are plenty of opportunities for fallout to reach your paint. When your car is at an auto body shop, there are plenty of opportunities for it to come in contact with fallout. Between the grinding, welding and painting going on, even a car that isn’t being repainted may be contaminated. That’s why it’s important for the shop to section off work areas and give the paint a full detail before the vehicle leaves the shop. There’s a lot of grinding and cutting going on in a body shop, and that means metal dust in the air that can land on bare body panels. If aluminum dust gathers on a bare steel panel or steel or iron gathers on a bare aluminum panel, it can keep the primer and paint from adhering. This isn’t obvious at first, but it can lead to paint issues months or years down the road. To combat this, aluminum and steel repair areas are sectioned off, and filtration systems are used to remove metal particles from the air. Dirt can be washed off easily when it’s on paint, but not when it’s embedded in it. With each step of the paint process, technicians have to take the utmost care to prevent surface and paint contamination. Before the vehicle is painted, a tack cloth and cleaner is used to remove any remaining dust and dirt on the surface. Every part of the painting equipment has to be thoroughly cleaned between paint jobs, and every coating from the paint to the clearcoat needs to be strained before being poured into the paint gun. The paint is applied in a paint booth with an air filtration system designed to eliminate dust. It uses positive pressure, pushing filtered air into the room to keep from pulling dust through cracks that can lead to contamination. Once painting is complete, the paint is “baked” to push out solvents and accelerate hardening. The sooner the paint hardens, the less chance a stray piece of dust will stick to the paint. – Oil was left on the surface when it was painted. This includes skin oils left behind when someone touches the panel with a bare hand. – The wrong compressor oil was used, and some of it made its way through the hoses and into the gun, where it mixed with the paint. – The hoses used to send air from the compressor to the paint gun aren’t paint compatible. That means they may contain silicone, which can make its way into the paint. 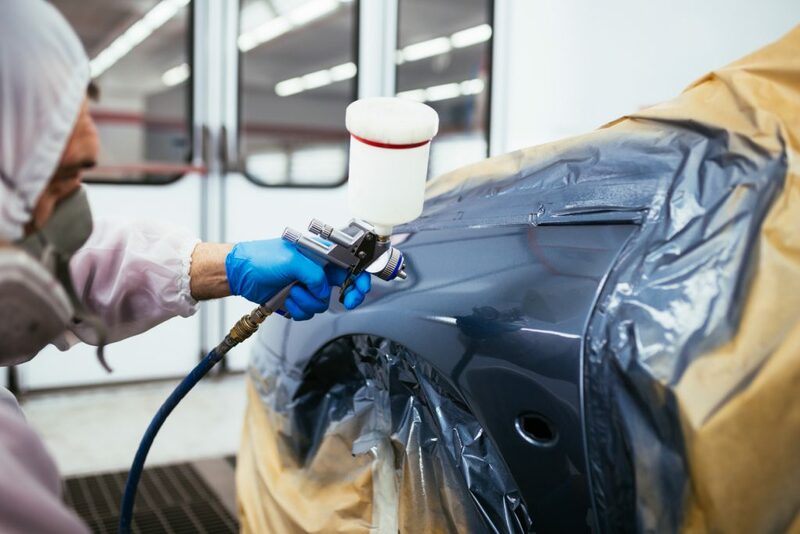 You can trust your car will get a professional paint job when you take it to Merton Auto Body. We have top technicians with the latest certifications from ASE and I-CAR, and we use the Spies-Hecker paint system, which is certified by more vehicle manufacturers than any other brand on the market. It doesn’t matter if your area code is 53089, 53092, 53066, 53188, 53072 or 53058, if you’re in Lake Country, we’re just a short drive away in Sussex, WI.